Synthetic and Bio Emulsion Polymers Market size was above USD 25 billion in 2016 and industry expects to surpass 15 million tons by 2024. Strong application outlook from paper & paperboard coatings, paints & coatings and adhesives industries should stimulate emulsion polymers market size. Supporting government regulations by REACH and EPA pertaining to usage of eco-friendly products should propel product demand in Europe and North America. Increasing vinyl acetate polymers application scope in adhesives should stimulate product demand. Superior properties such as binding, adhesive and film forming along with high usage of vinyl acetate in bookbinding, textiles, on-site construction and paperboard packaging should boost emulsion polymers market size. Global adhesives & sealants market may surpass USD 50 billion by 2024. Increasing adhesives application scope in automotive, packaging and construction industry should stimulate market growth. Strong application outlook in paints & coatings industry owing to less energy consumption and low carbon emission in manufacturing process is likely to drive polymer emulsion market size. Paints & coating have extensive application in various end-use industries such as automotive, marine & aviation industries, architectural and manufacturing industries which may have positive influence on market growth. Bio-based emulsion polymers are produced from 100% renewable resources and may act as an effective alternative for its synthetic counterparts which may stimulate industry growth. Rise in environmental constraints are forcing EPA and REACH to implement stringent rules for usage of biomass derived products. These bodies are implementing regulations to control toxic emissions and minimize noxious impact on environment by framing standards under the Clean Air Act. Synthetic emulsion polymers are manufactured from crude oil & natural gas by-products including styrene and acrylics. Fluctuating crude oil index may act as a major constraint for industry growth thereby affecting emulsion polymer market price trend. Manufacturers need to comply with stringent regulations on production of low VoC emitting products, which may pose challenge for industry growth. Synthetic emulsion polymer based styrene-butadiene (SB) latex market size should surpass USD 9 billion by 2024. It is a polymer emulsion composed of styrene and butadiene. SB latex contains 45 to 80% styrene, having wide range of applications including paperboard coatings, coated/pigmented paper and carpet back-coatings. Styrene content in the latex is varied depending on the physical properties desired in the manufacturing of final product. It improves printing performance and brightness uniformity, results into usage in coated printed papers such as advertising flyers, annual reports, magazines, catalogs and label stocks. Rise in SB latex demand mainly in China and U.S. owing to positive application scope in paper coatings will drive emulsion polymer industry growth. Acrylics polymer emulsions market size may register gains at over 4% owing to its wide application scope across the paper coatings, adhesives, paint, cement modifier and textile industry. Effective water resistance coupled with quick drying ability when compared to its competitive counterparts further thrust the product demand. Acrylics are widely used in personal care items and superabsorbent polymers owing to its stability, high technology and chemical purity. Acrylics are further projected to sustain majority of market share, subjected to rapid technological advancements along with superior characteristics such as hardness, storage and alkali resistance. Increasing adoption of acrylic based products across Europe may substantially drive industry growth. Paint & coating based applications are projected to witness considerable growth at over 6% at the end of forecast timeline owing to increasing investments in real estate sector. Growth in refurbishment activities of existing infrastructure in Europe favoured by stringent government regulations pertaining to adoption of bio-based products may drive industry growth. Rising environmental constraints coupled with rapid technological advancements drive product demand. Synthetic emulsion polymers market size from adhesive applications should surpass USD 8.5 billion by 2024. Global adhesives market size was over 10 million tons in 2016. Superior characteristics of adhesives based on emulsion polymers includes absence of flammable solvents reduces the risk of fire, particularly in automotive and paper & paperboard packaging industry. Increasing usage of environmentally compliant materials such as hot melt and radiation curable adhesives which are cost-effective should result in growth in product demand. Europe emulsion polymers market size, driven by Germany, France and UK should surpass USD 10 billon by 2024. Supportive governmental regulations on promotion of green buildings along with rise in demand for low VoC products should stimulate product demand. Strong presence of automotive giants coupled with regulations enforcing manufacturers to decrease carbon footprints in production of polymer emulsion paints & coatings will enhance regional growth. 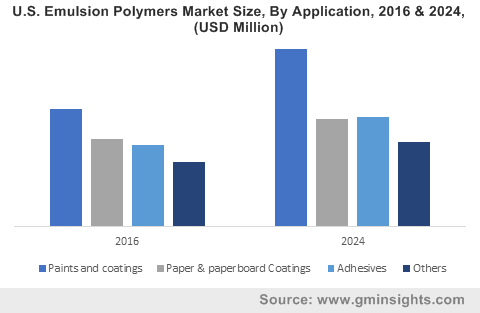 China emulsion polymers market size should witness significant gains at over 6.5% by 2024. Increase in infrastructure spending along with paint & coating industry development will drive regional demand. Low cost for setting up of manufacturing sites of coupled with availability of skilled labours at low wages, results to decrease in operational cost of manufacturers, thereby stimulating product demand. Low electricity & water cost and easy availability of feedstock also aid to regional industry growth. MEA, led by UAE and Saudi Arabia emulsion polymers market size, should witness gains at over 4.5% by 2024. Increasing high quality paints & coatings demand along with growth in construction projects should positively influence regional growth. Growth in water-borne coatings demand from paints & coatings industry, should further stimulate regional product demand. 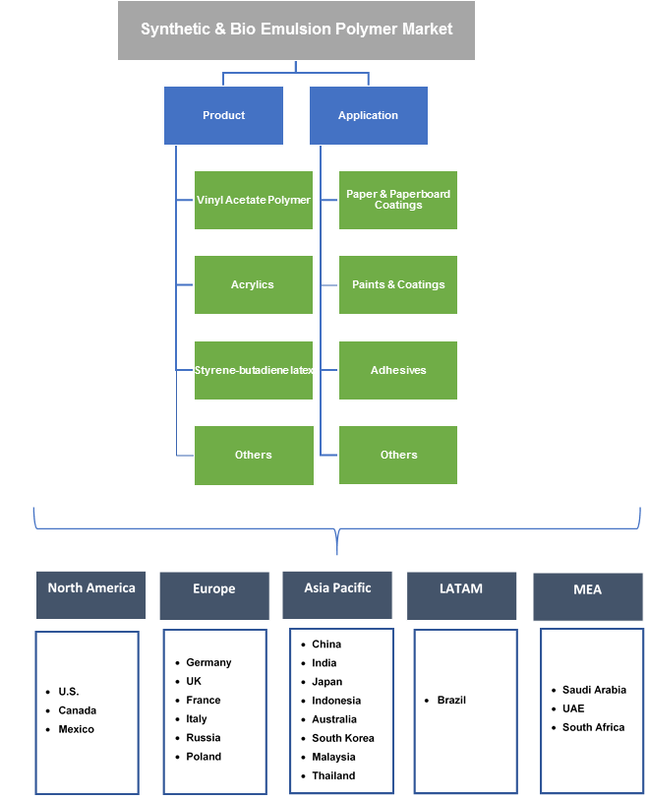 Global emulsion polymer market share is moderately fragmented. BASF, Arkema, Lubrizol Corporation, DIC Corporation, Wacker Chemie, Momentive Performance Materials, Trinseo, Nuplex Industries, Omnova Solutions, and DOW Chemical are some of the key industry participants. Industry participants are adopting various strategies including mergers & acquisitions, product launch, agreement & collaborations and heavy investment in research & technologies to develop new products for promoting usage of bio emulsion polymer. Emulsion polymer are derived from by-products of crude oil & natural gas such as styrene and acrylics. Synthetic products are used in bottle labelling adhesive as base polymer owing to its fast setting time. Growth of adhesives and paints & coatings industries along with favourable government regulations is expected to drive market size. Bio emulsion polymer pose same structure and chemical properties as that its synthetic counterparts. It has renewable content of 20 to 70% by volume. It can be replaced with its conventional counterparts without compromising material performance and no additional costs.